When having a child, it’s essential to think about the health of both mom and baby. However, one key aspect of pregnancy is often overlooked: oral health. Studies show that poor maternal oral health can have a significant impact on a woman’s systemic health and that of her children. Most expecting parents don’t realize the importance of oral health, or that there are specific steps one can take to help ensure great oral health for years to come. So what’s an expecting mother to do? If you are planning your pregnancy, try to make a dental appointment before conceiving. Your teeth and gums should be professionally assessed and any oral health problems treated before you get pregnant. Gum disease during pregnancy can cause preterm delivery and low birth weight so it’s important to stay on top of your oral health! Some dentists recommend visiting them during each trimester to keep a close eye during this sensitive time, so be sure to discuss your visit plan ahead of the pregnancy. This is also a great time to ensure your daily oral health routine is in great shape to maintain throughout the pregnancy! 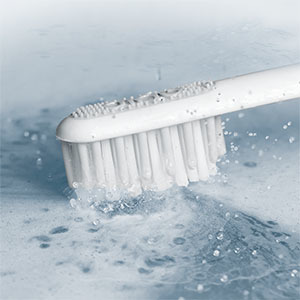 Check out our brushing tips to make sure you’re brushing the right way, for 2 minutes, twice a day and refreshing your brush head every 3 months! 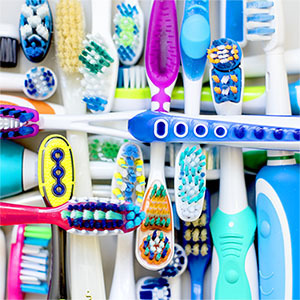 If you feel you are regularly skipping any of these basics, an electric toothbrush and brush head subscription service like quip will offer great good habit guidance. Routine dental care is just as important during pregnancy and can be done at any time, but is best left for the second trimester (and it’s always a good idea to check with your OBGYN and dentist first). All elective dental procedures should be delayed until after the baby is born. Pregnancy causes hormonal changes that can put you at increased risk for gum disease and pregnancy gingivitis, a condition that causes tender gums to bleed easily. Get in touch with your dentist if you notice any changes in your gums during pregnancy such as tenderness, bleeding or gum swelling. Morning sickness may lead to the avoidance of daily brushing, resulting in an increased risk for tooth decay and sensitivity. Using a fluoridated toothpaste, chewing sugarless or xylitol gum, and eating small amounts of nutritious food throughout the day can help minimize the risk for tooth decay. You may also consider taking Vitamin K2. Pregnancy specialist Gail Dahl talks about the benefits of taking K2 such as preventing possible cranial issues that can create narrow dental arches, crooked teeth, underdevelopment of the face and jaw, underdevelopment of the sinuses, and poor tooth development resulting in high susceptibility to dental cavities. Lastly, do your best to eat a healthy, balanced diet. Your baby's first teeth begin to develop about three months into pregnancy. Healthy diets containing dairy products, cheese, and yogurt are a good source of the essential minerals and are crucial for the baby's developing teeth, gums, and bones.. If you experienced any gum problems during your pregnancy, see your dentist soon after delivery to have your entire mouth examined and periodontal health evaluated. It’s never too early to give your newborn the gift of good oral health by setting a good example! Brush your teeth in front of your child daily, and start brushing the baby’s teeth with a soft brush as soon as the first tooth comes in. If you are able to breastfeed, it can help progress the development of your baby’s mouth. Not only does breast milk offer the baby minerals that help build strong teeth, but the latching and sucking motion can help the baby develop a strong and functioning jaw and airway as she/he matures. If you don’t breastfeed or use breast milk, talk with your physician about other ways to support your baby’s developing oral health! Preparing for and having a baby comes with an overwhelming amount of information and advice on what’s best for the baby and the family. Ultimately, it’s up to you and your physician to decide what is best. 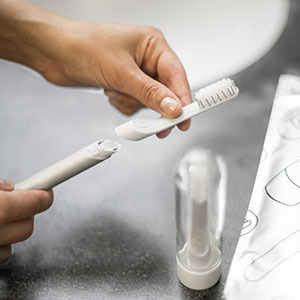 The topic of the mom and baby’s oral health is often overlooked in this discussion, so these tips should make incorporating oral health feel easy and approachable. A few key steps like sticking to a regular brushing routine, seeing a dentist before conceiving, and incorporating key vitamins and minerals into your diet can help ensure that both mom and baby have improved oral health.